Or, get it for 142800 Kobo Super Points! This timely and authoritative set explores three centuries of good times and hard times in major economies throughout the world. More than 400 signed articles cover events from Tulipmania during the 1630s to the U.S. federal stimulus package of 2009, and introduce readers to underlying concepts, recurring themes, major institutions, and notable figures. Written in a clear, accessible style, "Booms and Busts" provides vital insight and perspective for students, teachers, librarians, and the general public - anyone interested in understanding the historical precedents, causes, and effects of the global economic crisis. 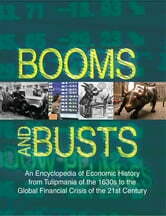 Special features include a chronology of major booms and busts through history, a glossary of economic terms, a guide to further research, an appendix of primary documents, a topic finder, and a comprehensive index. It features 1,050 pages; three volumes; 8-1/2" X 11"; topic finder; photos; chronology; glossary; primary documents; bibliography; and, index.